My very good friend Linda Lighthouse wanted a boyfriend. She always wants a boyfriend, and to be fair, she always has one. Linda is one of those women who is never single for long. This time, it took a whole three weeks. She used a neat little device called a VISION BOARD. Now, I am not saying she got a boyfriend because she made a vision board. 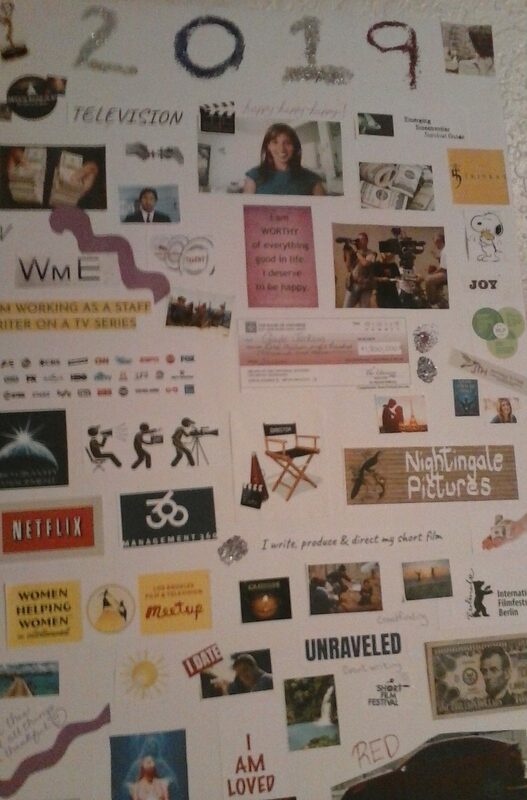 I am saying the vision board helped her subconscious mind allow what she wanted to come into her life. So being the wide open-minded person I am, I am going to create a vision board for 2019 to help my emerging screenwriting career. Let’s be clear, I’m not getting carried away here. Looking on the internet for guidance, as one does, I see literally dozens of sites dedicated to Vision Board Parties. Say what now? Yes, apparently this is the new thing for suburban moms looking for a safe girls night out. Vision Board parties have replaced book clubs and wine tastings at your local meet up for fun and friendship. The idea is, you look at your board whenever possible and reprogram your Subconscious Mind to allow those images to manifest in your reality. An entire cottage industry has grown around the idea of allowing, accepting and receiving. Of course you remember Law of Attraction. It’s not a fad. You (and I really mean Me) may say It won’t work, It won’t work for me, It’s stupid, I don’t have time, I’m doing it wrong, but that’s exactly the conscious No beating the subconscious Yes that keeps the Law of Attraction folks flying private to book signings. Books like The Artist’s Way by Julia Cameron, The Four Agreements by Don Miguel Ruiz, You Are A Badass by Jen Sincero and anything by Jerry & Esther Hicks or Deepak Chopra all say pretty much the same thing in different ways. And made their author fortunes. No, I will not be cynical. This is a legitimate project and I will put my very best self into it. For solitary vision board makers like myself I prefer the old school cut, paste and decorate over the digital grab photos and download an app. I think cutting photos, glueing them to a poster board and dousing it with glitter sends a stronger “I really want this” message to my subconscious. I am not my friend Linda who has had more success and can tap into those happy feelings easier that I can. So this Vision Board Project 2019 will be a challenge. I need to reprogram my subconscious to allow what I want to flow into my space and manifest successfully. How some images in a collage are going to do that, I do not know. This is kind of a leap of faith. First—I have to figure out what I want my subconscious to allow. I have created the acronym TUFF to describe what I want to manifest in 2019. T = Television – as an emerging screenwriter, my new manager that I got last year wasn’t a good fit. So I need someone new. F = Features – I have been so focused on TV, I have forgotten to peddle my wares as an emerging screenwriter. I need to manifest connections to production companies. F = Fun – With all the stuck in the mud, my emerging has taken the joy out of my life and I need some fun and (new) friends. Third – I have also included Affirmations and positive phrases to help my mind reprogram and visualize the success they represent. Each month I’ll check back in and let you know how it goes. I am a successful screenwriter. Not because my Vision Board says so, because I say so. Wishing everyone a happy and prosperous New Year. Cheers!